SoundHound is one of the apps you can use to recognize those songs you hear playing in the background, whether it's in a commercial or in a department store. Now its developers are bumping things up to version 6.3 and giving everything a spiffy new look. The interface above will probably look similar across platforms. Overall, everything is still dark and looks generally SoundHound-y, but stuff has moved around a bit to make music more discoverable. That's what the changelog says, anyway. You can access the search and navigation buttons from anywhere just by swiping from the right. When you're on the home screen, you can view your recent searches and see what's currently popular. Or you can just tap that big orange icon to start listening for sounds. New colorful and dynamic listening screen animation"
To really get an understanding of what's new, here's the press release. The update is still making its way out to the Play Store. SANTA CLARA, Calif. – Nov. 11, 2014 – SoundHound Inc., a pioneering company in sound recognition and search technologies, launched a new version of its music search, discovery and play app today. 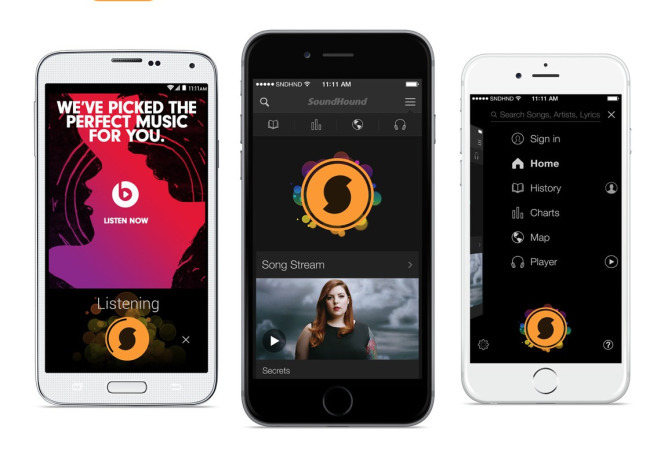 Evolving beyond its trademark music and sing/hum identification, SoundHound has developed into the gateway to all-things music, with a modern and intuitive design, unrivaled features and content to continually delight users. This marks SoundHound’s most significant visual change to the app, which has been used by more than 230 million mobile users around the world. The update is available for iOS and Android mobile devices, globally.